Having decided to start fresh, Scotland’s KT Tunstall downsized her life and moved to California. Thinking she would focus on music for television or film, she found herself instead waking up at night with big pop choruses in her head. Perhaps it was driving around L.A. listening to Tom Petty and Fleetwood Mac or driving through Laurel Canyon where so much great music was born. Unable to ignore the songs brewing in her brain, KT went about capturing them on tape and found herself with a record. The idea of family and community resonates through KIN with the album veering away from her previous collection’s downbeat folk to reconnect with her debut’s brash, upstart pop: engineered in embraceable lyrics and filled with insatiable hooks. “A songwriter’s brain is like a juicer blending all their influence together,” KT says, “and you hope you come up with something original, and not something that tastes like beets.” Whether drawing from her love of Patti Smith and Bo Diddley or inspired by seventies FM radio, KT stokes that star-making machinery with big beats and even bigger emotions. A veritable dynamo, the pint-sized singer, songwriter and guitarist bounced happily all over the stage, duck-walking and scissor-kicking while her husky voice roared in the rock-pop anthems and curled like a kitten in the tender well-crafted ballads. Ms. Tunstall’s energy was positively infectious, bringing the crowd to their feet and energizing her talented band-mates to match her inexhaustible passion. 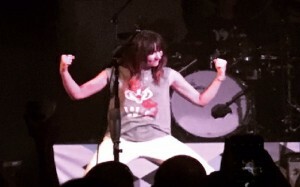 As a long-time songwriter, KT appreciates other songwriter’s songs as well; injecting a subtle nod to, “Seven Nation Army,” into one of her tunes, melting a good chunk of, “Walk Like An Egyptian,” into her, “Hold On,” and adding a killer cover of Chaka Khan’s, “Ain’t Nobody,” into her encore; insisting a proper Friday night out had to include a cover. Claiming the new record has found her the happiest she’s ever been, KT ended the evening sharing her answer to the meaning of life; enjoy yourself. Whether fanatical fan or casual observer, KT went all out to guarantee any time spent with her insured everyone absolutely enjoyed themselves.